Sizi Pu (四子谱) is written by Guo Bailing (過百齡, c. 1587 - c. 1662, titled daguoshou), who also authored Guanzi Pu (官子譜) and Sanzi Pu (三子譜), the latter of which has been translated into English under the title Three-Stone Games. Sizi Pu contains hundreds of diagrams from Guo's research on four-stone handicap games. Many of the variations contain dozens of moves (occasionally more than 100), as a result of quarter-board or even half-board fights. 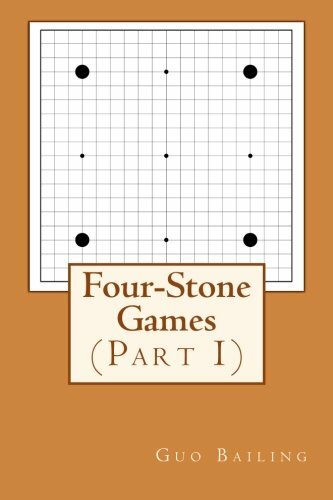 The book has been translated into English by Ruoshi Sun in 2014 under the title Four-Stone Games in two volumes. It is available on CreateSpace and Amazon. Sample pages can be viewed on Amazon. "It is the author's intention to elucidate the countless variations and let people realize that they all follow the basic principles." -- Guo Bailing in Sizi Pu. "Guo Bailing's attachment has been an impregnable bulwark in his entire life. ... In Sizi Pu, Bailing has (almost) exhausted the attachment variations." -- Xu Xingyou in Jianshantang Yipu.